Cornwall is a peninsula, the southern tip of the Island of Great Britain. A ceremonial county since 1997 and unitary authority since 1992 of England within the United Kingdom, she is west of Devon, over the River Tamar bordered on the north and west by the Celtic Sea and by the English Channel on her south. A ceremonial county is a county to which a Lord Lieutenant has been appointed to assist in local rule. A unitary authority allows local government in the district. 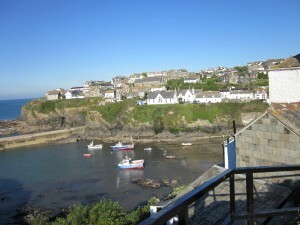 Cornwall’s population is around 536,000. The only city in Cornwall is Truro (City status in Great Britain is determined by the reigning monarch,) Truro is also the administrative center though St. Austell is actually its largest “city”. Cornwall is under English rule, as are Scotland, Wales and Northern Ireland. Humans showed up in Cornwall in the Palaeolithic and Mesolithic periods. She was continually occupied after they moved on or disappeared by Neolithic and Bronze Age humans. The Brython Celts with ties to Wales and Brittany seem to have lived there during the Iron Age. There is very little evidence of Roman Rule. 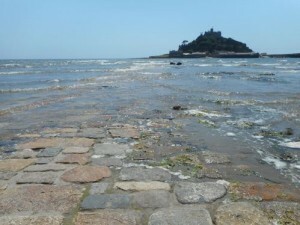 By the Norman conquest of England in the 11th Century, Cornwall was under English rule. The Norman invasion transferred most of the land to Breton-Norman aristocracy bringing in the Breton Celtic influence supplanting the Saxon influence in architecture. The Normans being absentee landlords, and quite happy leaving the families who remained of the ruling class of Cornwall (referred to as Cornu-Norman) in charge. The Cornish language evolved from a combination of Norman, French(Breton), Cornish, Latin and English. It eventually became a language of its own, a separate language from the Breton which was its Celtic mother language. Christian missionaries came from Ireland and Wales in the 5th Century AD. Saints galore are attributed to Cornwall Naturally, many of them are the pre-congregation saints,that were prevalent in that era of the Catholic Church. Because of this Cornwall has been blessed with three patron saints. 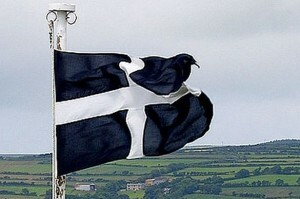 St. Piran is most joyously celebrated as country’s favorite patron. However, St Michael the Archangel had been acknowledged and referred to as the patron saint in Norman times and is still recognized as Protector of Cornwall by the Anglican Church. St. Petroc, patron of the Cornish diocese before the Normans came, is also a patron and often referred to as the Captain of the Cornish Saints. Minority Report – A History in the Making?